Enabling integration with EasyPost provides direct API access to shipping and logistics, when a user purchases a physical item. This allows for items to be priced based on the current price to ship an item, direct from the supplier of that service. 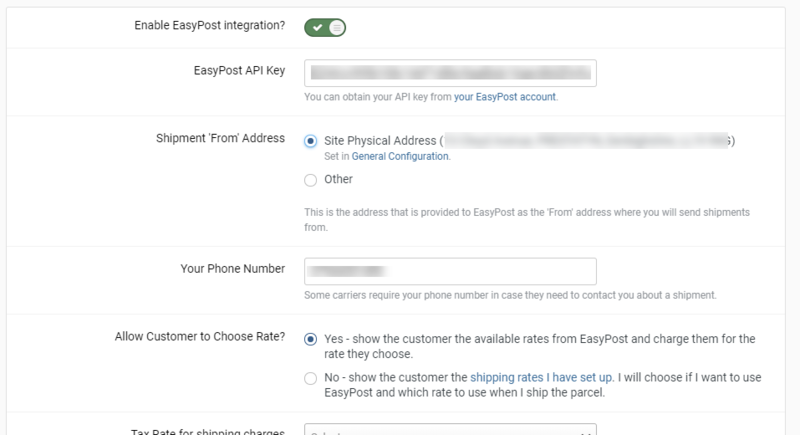 In order to create a EasyPost API key, you will first need to create an EasyPost account on their website. Once logged in, click the API link shown in the left bar, as shown in the following image, by selecting your name, then API Keys. You need to copy the Production API key from this location. Once here, select the "Enable" button under EasyPost. You will then be shown the following where you need to enter the key you have just created and select 'Enable'. For EasyPost, you must have an address set up to set from, which can also be set either in this location, or it can use your settings from General Configuration if needed. Add a product, a member, and a destination address. You will then be shown the rates available for that chosen location.